Manchester United wing defender, Matteo Darmian, is pointing that Gary Neville and Patrice Evra as his role model. 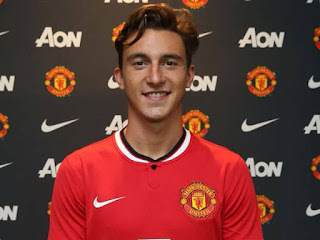 However, Darmian feel inferior when he compared with both of its predecessors. Therefore, Neville and Evra have many achievements to United. Neville won eight Premier League trophies and the two of UEFA Champions League, while Evra won the five of Premier League titles and one of the Champions League. When this is compared to Darmian, he has never won the trophy at club level. Until the weekend of the 22nd Premier League, United is still stuck in fifth position. Darmian said that comparison with other great players, he always be something difficult. Both are champion figure. He feels that it's better to make them as the idols to be followed. Darmian also added that they were really great. It is almost impossible for him to emulate what they achieved. However, there is a push for him to at least come close to what they have done. Darmian felt that he is lucky because he once dueled directly with Evra in the 2014-2015 seasons. At that time, Evra defended Juventus, while Darmian's status was a Torino player. Darmian explains that he has a chance to make contact with Evra. He was against Evra twice in the derby party. Like the time with United, he proved himself as a champion in Italy. Darmian himself directly penetrates the core team in his first season with the Red Devils. Manager Louis van Gaal has given him the rations of 1,943 minutes at various events during the season.